Looking at a map of New York, it is evident that the State of New York is bounded by the Canadian Province of Quebec on the north and by New Jersey on the south. It is bordered by Massachusetts on the east and by Lake Erie on the west. New York State is bordered by Vermont to the northeast, by Connecticut to the southeast, and by Pennsylvania to the southwest. Lake Ontario and the Canadian Province of Ontario lie to the State's northwest. New York is the 30th largest state in the United States, and its land area is 47,214 square miles (122,284 square kilometers). New York City contains five of the state's 62 counties. This New York map site features road maps, topographical maps, and relief maps of New York. The detailed, scrollable road map displays New York counties, cities, and towns as well as Interstate, U.S., and New York state highways. The pannable, scalable New York street map can be zoomed in to show local streets and detailed imagery. to view a scalable New York road map. The detailed New York map and the regional New York map display cities, roads, rivers, and lakes as well as terrain features. The detailed map shows only the State of New York, while the regional map shows New York and the surrounding region. New York's capital city is Albany. Other major cities in New York include New York, Buffalo, Rochester, Yonkers and Syracuse. 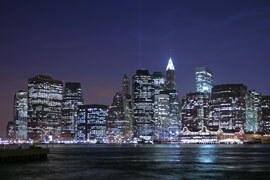 In 2005, the population of New York was estimated at 19,315,721, which is about 407.8 people per square mile. In 2010, New York's population rose to 19,378,102 people. The state's Interstate Highways include I-81, I-84, I-86, I-87, I-88 and I-90 as well as I-495 and other auxiliary routes. New York was named in honor of the English Duke of York. Much of New York State's terrain is hilly or mountainous. The Adirondacks dominate the northeast, while the Catskills are located in the southeast. The hilly Appalachian Plateau slopes down to Lake Ontario and the Saint Lawrence River in the northwest. The state's chief river, the Hudson, drains the north and empties New York Bay, an important East Coast seaport. 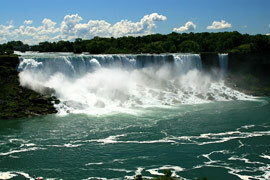 Popular tourist destinations include Niagara Falls and New York City's many museums and attractions. Summer vacationers flock to Long Island's beaches as well as Lake George and the Finger Lakes, while skiers and snowboarders enjoy the snowy Catskill and Adirondack slopes during the winter months. 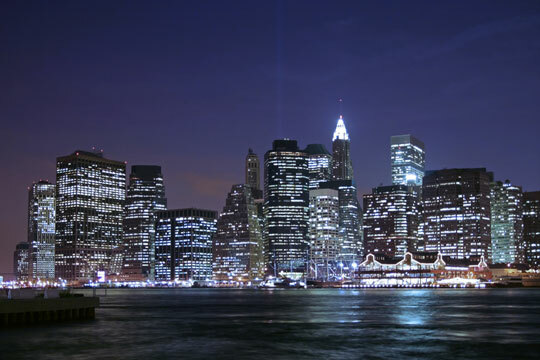 For detailed New York travel and tourism information, visit the official New York tourism site and New York Atlas. This New York reference map shows major cities, roads, railroads, and physical features in New York. 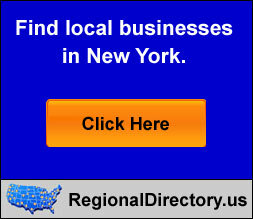 Several map publishing companies offer printed maps of New York. For example, Omni Resources offers several maps of New York that feature points of interest, airports, and parks, as well as selected local attractions and insets of major New York cities. New-York-Map.org Editor, State Maps, PO Box 775, Barnegat, NJ 08005.